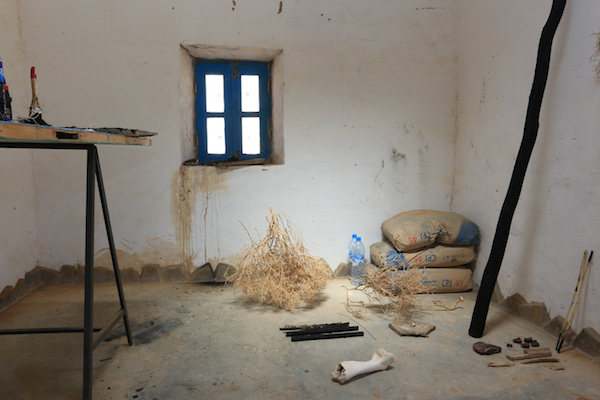 Nicole Foreshew, ‘Studio, Morocco’, 2017. Courtesy: the artist. A contemporary artist and member of the Wiradjuri nation (Central West NSW), Foreshew works across a range of mediums: photomedia, design, sculpture, film and video. Her practice encompasses multi-layered themes that are informed through a deep connection to Country, its environment and geological sites of significance – all of which are hallmarks of her work. Foreshew engages with the complete usage of land and has extended her exploration internationally, recently visiting North Africa to look at the role that excavated material has traditionally played in culture, referencing the institutional ‘artefact’ and forming comparisons to ceremonial or everyday uses of earth materials.